Home of Pontiac Power ! To check manifold pressure with a vacuum gauge you need to locate a port on the intake manifold or throttle body. Manufacturer's install ports on their manifolds for lots of different reasons: Brake Booster, PCV tube, EGR Switch, A/C vents, etc. You simply need to find one small enough for the vacuum gauge line to slide onto firmly. A quick snap of the throttle plate should drop the vacuum to around 5 "hg vacuum, and then it should recover to a steady 21 "hg vacuum. When this air is mixed with atomized fuel from the fuel injectors, engine speed is increased. For every 1000 ft. of increase in altitude, 1 "hg is subtracted from the vacuum reading. Normal Engine: On a normal engine, accelerate to around 2000 rpm and then quickly release the throttle. 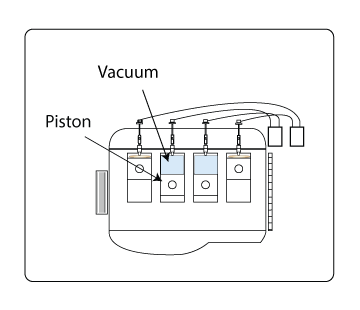 The engine should snap right back to a steady 17- 21 "hg vacuum. Steady low between 5-10 "hg vacuum: This indicates that the engine has a leak in the intake manifold or the intake gasket. This leak should be easy to find because it would be making a loud hissing noise. 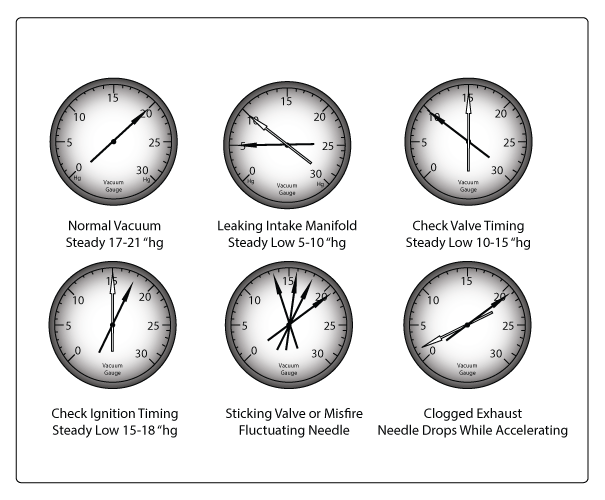 Needle drops during acceleration: If the needle drops steady during acceleration there's a restriction in the exhaust or intake. This is typically due to a clogged CAT or muffler.